In his Facebook post, Robert Vadra said that there is a very vindictive and vicious political atmosphere; it's her duty to serve the people and now we hand her to the people of India. Robert Vadra, the husband of newly-appointed Congress general secretary Priyanka Gandhi, on Monday wished her luck in a Facebook post as she rolled out her campaign for the general election with a mega roadshow in Lucknow. "My Best wishes to you Priyanka, on your new journey of working in Uttar Pradesh and serving the people of India," Robert Vadra wrote in an emotional Facebook post. 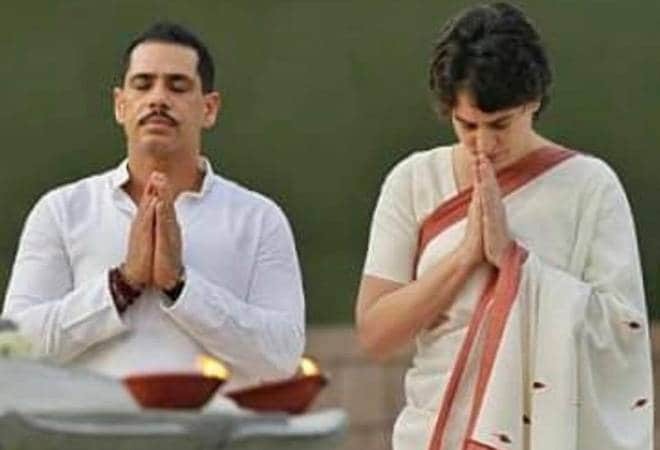 Robert Vadra, who married Priyanka Gandhi on February 18, 1997, said that you have been my best friend, a perfect wife and the best mother to our children. "There is a very vindictive and vicious political atmosphere... But I know, it's her duty to serve the people and now we hand her to the people of India," he wrote. 'Please Keep Her Safe', said Vadra in his Facebook message. Priyanka and Rahul Gandhi rolled out Congress' 'Mission UP' today. Priyanka made her debut in politics as the party's general secretary in-charge of eastern Uttar Pradesh two weeks ago. Priyanka has a huge fan following and is being regarded by many as the Congress' big hope in the critical state of Uttar Pradesh ahead of the Lok Sabha polls. Priyanka Gandhi also officially joined Twitter on Monday. Soon after she joined the micro-blogging website, Priyanka Gandhi was followed by as many as 22,000 users. Vadra had a tough last week as he had to appear thrice before the Enforcement Directorate (ED) over money laundering allegations.